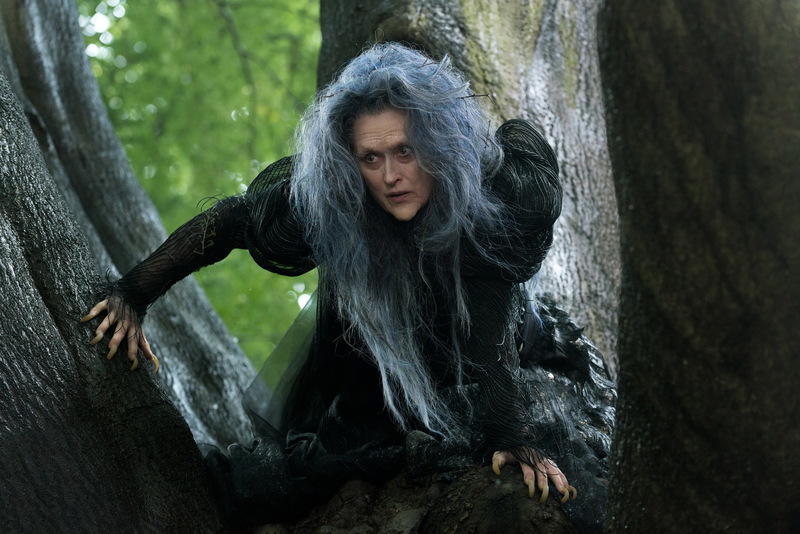 The Witch (Meryl Streep) wishes to reverse a curse to restore her beauty. I saw this movie musical last weekend with my parents; they are both big fans of Meryl Streep. We didn’t know what to expect, since we hadn’t seen the play or read up on many details. I just thought it was a reimagining of several fairy tales with songs. It was directed by Rob Marshall (who has an unexpected hit with Chicago). The Baker (James Corden) and his wife (Emily Blunt) wish for a child. We were pleasantly surprised to see that Emily Blunt was a key role- she plays The Baker’s Wife. 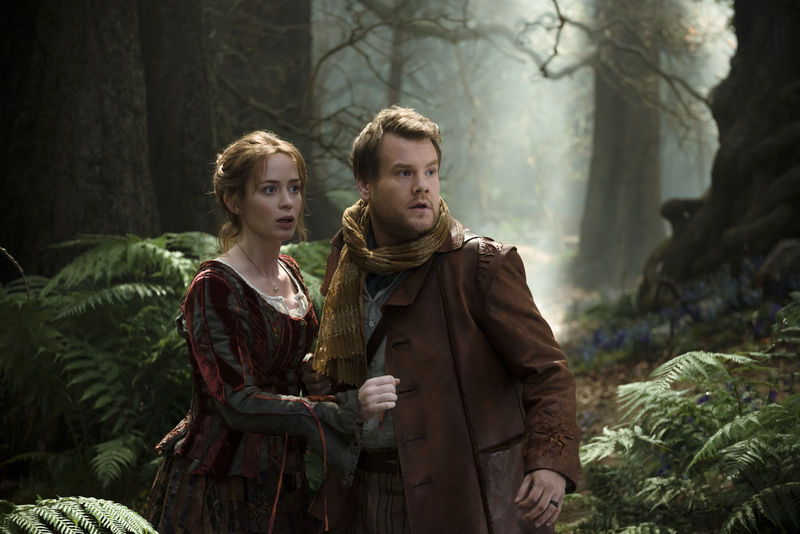 The Baker is played by a likeable Everyman type, James Corden, who is from the theater world. These actors had good chemistry together and made a quite believable couple. They were the center of the story. 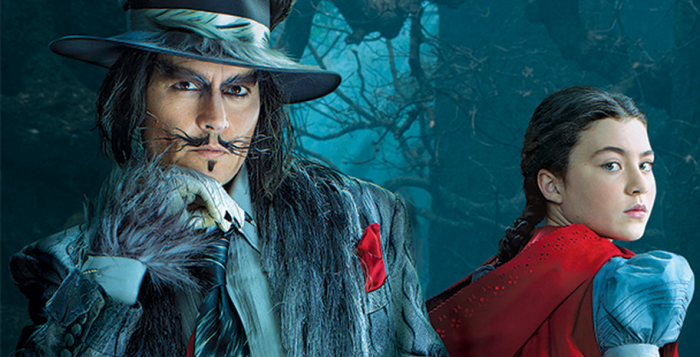 The Wolf is played by Johnny Depp. The Wolf (Johnny Depp in a small role) has a song about the deliciousness of Little Red Riding Hood and Granny; this bordered on controversy because of the lyrics. The song was changed from the original version (which was heard by playgoers). Cinderella’s stepmother is played by Christine Baranski (center). Fans of The Good Wife will get a kick out of seeing Broadway vet Christine Baranski and Tammy Blanchard (who had a recurring roles on the courtroom drama series). I got a kick out of their outlandish hairstyles and clothes. And the trying on the shoe part- well. you’ll see! Cinderella (Anna Kendrick) is indecisive about The Prince. 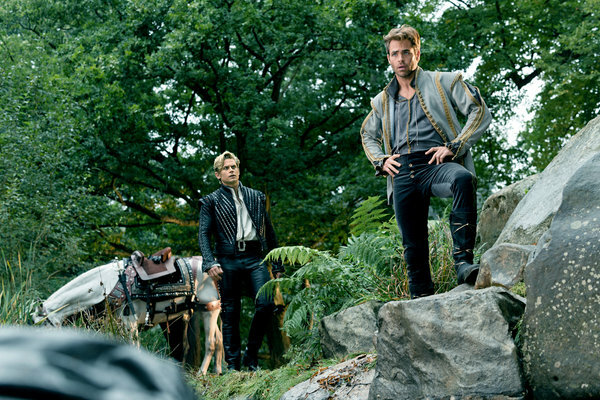 Cinderella’s prince is played by Chris Pine (right). Careful the path they take, wishes come true, not free. Anna Kendrick seemed to be miscast as Cinderella; she even admitted that she thought she’d be cast as Red. The two princes have a hilarious duet along a waterfall (Agony)! Chris Pine, who actually looks good with a bit of a beard (unlike many men), said he did a Captain Kirk (William Shatner) impression at one point in the number. (I’m sure the Trekkies out there will notice it.) Pine did a good job with the material, I was surprised to see! Aside from Streep, Blunt, and Corden, young Daniel Huttlestone does a good job. You may remember him from the latest Les Miserables film, where he also sang. Tracey Ullman provided some bits of comedy as Jack’s irritable/critical mother. 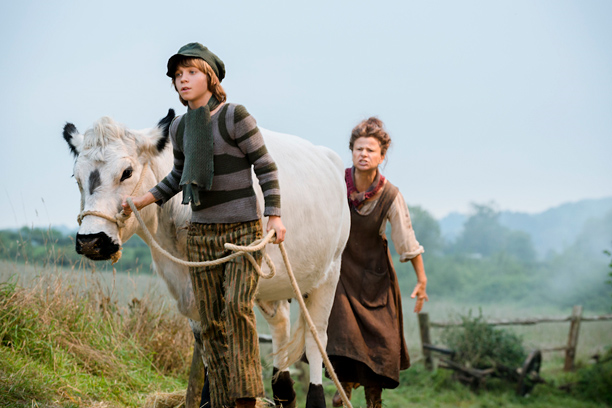 Jack (Daniel Huttlestone) with his cow and mother (Tracey Ullman). One reviewer (IMDB) commented: “I think that the later half of the movie, after the ‘happily ever after’ scene, was not given the same attention as the first half of the movie. It felt like someone stepped in at the last moment and said: Hey, movies shouldn’t be allowed to have a happy fairy tale ending anymore. Let’s add some grim to it.” In response, a theatergoer said: “The stage show has a two act structure that works a lot better. The first act is the fairy tale happy ever after. The second, which takes place roughly a year later, is what happens when you get your wish but are still unsatisfied and want for more. The second act is really a metaphor for greed and looking a gift horse in the mouth.” If you want more analysis of the film, check out this podcast ep!